Statue of Liberty -  An epic journey of new discovery so fantastic that our natural instinct would be to block it out. who is best known for designing the Statue of Liberty. The Statue of Liberty’s head on exhibit at the Paris Exposition of 1878. That's the official story, even more than a century later. The statue, which was dedicated in 1886, is maintained by the National Park Service, whose website makes the claim so many of us learned in school: "The Statue of Liberty Enlightening the World was a gift of friendship from the people of France to the people of the United States." But how can “the people of France” give anything to anyone? For most of my life, I assumed the statue was a gift from the French government to the American government. Haven't we been conditioned to hear “the people” and understand instead “the State”? And didn't this gift to "the people of the United States" end up in the hands of the U.S. government? I always figured there was a national government on both the giving and receiving ends. But the Statue of Liberty was a private project. The designer was not a fan of the American people, nor was he particularly devoted to the idea of liberty: "The Americans believe that it is Liberty that illumines the world, but, in reality, it is my genius." Frédéric Auguste Bartholdi (http://en.wikipedia.org/wiki/Frédéric_Auguste_Bartholdi) wanted wealth and world renown for building a celebrated colossus, and he was willing to shop the idea around—even to the era's most illiberal customers. His first pitch for a giant, torch-bearing statue was to the Ottoman viceroy of Egypt, which was, at the time, the single greatest commercial conduit for the international slave trade. The statue that now stands in New York Harbor is officially called “Liberty Enlightening the World” (La Liberté éclairant le monde). The statue in Egypt was to be called “Egypt Enlightening the World” or, more awkwardly, "Progress Carrying the Light to Asia." When this bit of backstory reached the American public, Bartholdi denied that one project had anything to do with the other, but the similarity in designs is unmistakable. Egypt was a vassal state of an authoritarian empire and the gateway for the colossal African slave trade into Asia—whereas the fundraising for the Statue of Liberty proposed a monument not merely to liberty but to the recent abolition of American slavery. The original statue was to be an Egyptian woman—a fellah, or native peasant—draped in a burqa, one outstretched arm holding a torch to guide the ships on the great waterway over which she would stand. Bartholdi had wanted to place his piece at the northern entrance to the Suez Canal in Port Said because the canal represented French greatness in general and engineering greatness more specifically. His statue was to be a synthesis of French art and French engineering, as well as a political symbol of the progress that France offered the East. The canal was indeed a great engineering accomplishment and a giant step forward for world trade and greater wealth and comfort for everyone—including the toiling masses. But it was built on the back of slave labor, a 10-year corvée that forced Egyptian peasants to do the digging. Thousands died. If it was embarrassing for the American project that Bartholdi had not originally had the American people in mind, it was that much worse that the design for the great icon of liberty began as a symbol, however unintentional, of coerced labor from the commercial center of slavery. Fortunately for Bartholdi's vision, the controversy did not scuttle the project. But before he could talk "the American people" into receiving his monumental gift, he had to persuade "the people of France" to pay for it. Bartholdi and his confederate, the French politician Édouard René de Laboulaye, formed an organization called the French-American Union in 1875 and sought donations in both countries. France's national government did not contribute, but thousands of French schoolchildren made small donations. A copper company donated the metal sheets that would form the statue's skin. But these donations were not enough. More successful was a lottery held by the French-American Union, with prizes donated by Paris merchants. At every stage of the fundraising, Bartholdi felt insulted by the lack of public enthusiasm and the absence of "official" assistance. But he was flexible enough to do what was necessary. Ultimately, he filled the gap by doing what we still do with monuments today: He charged admission and sold souvenirs. People who were less than eager to donate money were happy to pay to see the inside of the incomplete statue’s head or climb to the top of the torch in the not-yet-attached arm. Does any of this mean that the Statue of Liberty fails to represent either liberty or the American people? Methodological individualism would require us to say that a group of French individuals funded the construction of the statue, and a different group of American individuals funded the base on which she now stands—its foundation dug into an island given to the project by yet a third group of individuals in the U.S. government. The American government ended up owning the statue, and therefore “the American people” own it in that euphemistic, grammar-school-civics-class sense. But in fact, there is a way in which the Statue of Liberty can legitimately be said to be American, and populist, and maybe even libertarian. After Bartholdi and Laboulaye failed to get anyone in America especially excited about the project, the newspaper publisher Joseph Pulitzer began a popular campaign for private donations to complete the base of the statue. His campaign attracted more than 120,000 contributors. Most gave less than a dollar. The U.S. government provided the island the statue now stands on, but they were stingy with “the people’s money” in a way that warms a libertarian’s heart. The real people’s money—money voluntarily donated by individual people themselves—made the American monument possible. So the statue, it turns out, was funded as much by French gamblers and entertainment seekers as by schoolchildren and shopkeepers; and on this side of the Atlantic, the final funds came from American newspaper readers. To the French, the project was Bartholdi’s, not theirs. But for Americans, by the end, the statue was ours. Pulitzer may have joined Bartholdi in the rhetoric of nationalism and populism, but it was capitalism that finally erected the great American symbol of liberty. 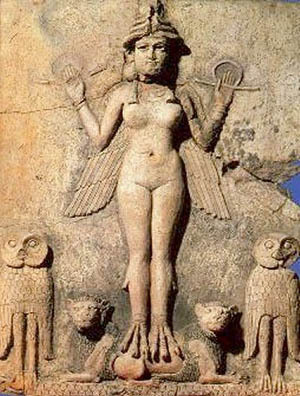 The Babylonian Ishtar, Imperial Rome's goddess Libertas was Papal Rome's "MOTHER OF THE HARLOTS AND ABOMINATIONS OF THE EARTH" and the template for America's Statue of Liberty. One of the many proofs of Freemasonry's cult of liberty, and furthermore of its deep influence upon our culture and mentality, is the Statue of Liberty. This colossus in New York's harbor was conceived by Freemasons, financed by Freemasons, built by Freemasons, and installed by Freemasons in a Freemasonic ceremony. The poem about "the huddled masses" inscribed on its base was written by American Jewess, Emma Lazarus. The maker of the statue was Freemason Frederic-Auguste Bartholdi. He had already made a statue of the Freemason Marquis de Lafayette for the city of New York, for the occasion of the centenary of the signing of the Declaration of Independence. Bartholdi sailed to America, at the suggestion of other Freemasons and kindred spirits in France, for the purpose of proposing the project. Although he had no drawings as he set sail, his Masonic biographer writes, as he entered New York harbor, "he caught a vision of a magnificent goddess (Nimrod's Semiramis—Isis or Astarte), holding aloft a torch (of Illuminism) in one hand and welcoming all visitors to the land of freedom and opportunity" (signifying Brotherhood control of the American people by the "liberties" perpetrated against them). Returning to France, he managed to raise, through the help of a great deal of Masonic propaganda, the sum of 3,500,000 French francs, a very large sum for the 1870's. For the face of his "Goddess of Liberty" he chose his own mother. Structural framework was provided by Freemason Gustave Eiffel, later to be famous for the 984-feet (300-meter) high Eiffel Tower. Although financial support for the statue was forthcoming in France, America was not willing to put up the money for the pedestal. It was Joseph Pulitzer, the owner and editor of the New York World, who managed to raise over $100,000 for the project. On Washington's Birthday in 1877, Congress accepted the statue as a gift from the French people. Bedloe's Island, now Liberty Island, was chosen by General Sherman, the well-known Atlanta-burner. Meanwhile in Paris the work gradually progressed. Levi P. Morton, the then Ambassador to France, drove the first rivet. The statue was finished on May 21, 1884, and presented to Ambassador Levi Morton on July 4th of the same year by Ferdinand de Lesseps, builder of the Suez canal. On the American side, the chairman of the American committee to receive the statue contacted the Grand Lodge of the Free and Accepted Masons of the State of New York. It had been a tradition in America to have the cornerstone of major public and private buildings and monuments"consecrated" with full Masonic rites, ever since Freemason George Washington, in 1793, had personally laid the cornerstone of the Capitol, with the assistance of the Grand Lodge of Maryland. The cornerstone of the Washington Monument, inscribed "Joseph Pulitzer, Russian immigrant and Jew." was also laid in a Masonic ceremony. The ceremony was set for August 5, 1884. It poured rain. The decorated vessel 'Bay Ridge' carried about a hundred Freemasons, along with some civil officials, to Bedloe's Island. Freemason Richard M. Hunt, the principal architect of the pedestal, handed the working tools to the Masonic officers. Then Freemason Edward M.,L. Ehlers, Grand Secretary and a member of the Continental Lodge 287, read the list of items to be included in the copper box within the cornerstone: a copy of the United States Constitution; George Washington's Farewell Address; twenty bronze medals of Presidents up through Chester A. Arthur [including Washington, Monroe, Jackson, Polk, Buchanan, Johnson and Garfield, who were all Freemasons]; copies of New York City newspapers; a portrait of Bartholdi; a copy of 'Poem on Liberty' by E. R. Johnes; and a list on parchment of the Grand Lodge officers. The traditional Masonic ceremony was observed. The cornerstone being found square, level and plumb, the Grand Master applied the mortar and had the stone lowered into place. He then struck the stone three times, and declared it duly laid. Then the elements of "consecration" were presented, corn, wine, and oil. The "Most Worshipful" Grand Master then spoke a few words. He posed the question: "Why call upon the Masonic Fraternity to lay the cornerstone of such a structure as is here to be erected?" His answer was: "No institution has done more to promote liberty and to free men from the trammels and chains of ignorance and tyranny than has Freemasonry." The principal address was given by the Deputy Grand Master: "Massive as this statue is, its physical proportions sink into comparative obscurity when contrasted with the nobility of its concept. Liberty Enlightening the World! How lofty the thought! To be free, is the first, the noblest aspiration of the human breast. And it is now a univally admitted truth that only in proportion as men become possessed of liberty, do they become civilized, enlightened and useful." The statue arrived in dismantled pieces in June of 1885. The statue was dedicated on October 28, 1886. President Grover Cleveland [who although sympathetically disposed toward the craft was not a Freemason] presided over the ceremony and Freemason Henry Potter, Episcopal Bishop of New York gave the invocation. Freemason Bartholdi pulled the tricolor French flag off the statue's face. The main address was given by Freemason Chauncey M. Depew, a United States Senator. In 1865 a young French sculptor named Frédéric-Auguste Bartholdi [wiki] went to a banquet near the town of Versailles, where he struck up a conversation with Edouard de Laboulaye, a prominent historian. De Laboulaye, a great admirer of the United States, observed that the country's centennial was approaching in 1876. He thought it would be a good idea for France to present America with a gift to commemorate the occasion. But what? Bartholdi proposed a giant statue of some kind ... and thought about it for the next six years. By 1871, Bartholdi had most of the details worked out in his mind: The American monument would be a colossal statue of a woman called "Liberty Enlightening the World." It would be paid for by the French people, and the pedestal that it stood on would be financed and built by the Americans. Filed Jan 2, 1870 by Bartholdi. The idea excited him so much that he booked a passage on a ship and sailed to New York to drum up support for it. As he entered New York Harbor, Bartholdi noticed a small, 12-acre piece of land near Ellis Island, called Bedloe's Island. He decided it was the perfect spot for his statue. Bartholdi spent the next five months traveling around the U.S. and getting support for the statue. Then he went back to France, where the government of Emperor Napoléon III (Napoléon Bonaparte's nephew) was openly hostile to the democratic and republican ideals celebrated by the Statue of Liberty. They would have jailed him if he'd spoken of the project openly - so Bartholdi kept a low profile until 1874, when the Third Republic was proclaimed after Napoléon III's defeat in the Franco-Russian Prussian War. Bartholdi went back to work. He founded a group called the Franco-American Union, comprised of French and American supporters, to help raise money for the statue. He also recruited Alexandre-Gustave Eiffel, soon to become famous for the Eiffel Tower, to design the steel and iron framework to hold the statue up. By now the centennial was only two years away. It was obvious that the huge statue couldn't be designed, financed, built, shipped, and installed on Bedloe's Island in time for the big celebration. But Bartholdi kept going anyway. Raising the $400,000 he estimated was needed to build the statue in France wasn't easy. Work stopped frequently when cash ran out, and Bartholdi and his craftspeople missed deadline after deadline. Then in 1880 the Franco-American Union came up with the idea of holding a "Liberty" lottery to raise funds. That did the trick. Statue of Liberty being built in Bartholdi's studio (left, source: NYC Architecture). Head of the Statue of Liberty, exhibited at the 1878 Paris Exposition (right, source:Statue of Liberty Head). In the United States, things were harder. There was some enthusiasm, but not as much as in France. It was, after all, a French statue ... and not everyone was sure the country needed a French statue, even for free. The U.S. Congress did vote unanimously to accept the gift from France ... but it didn't provide any funding for the pedestal, and neither did the city of New York. Neither did the state. 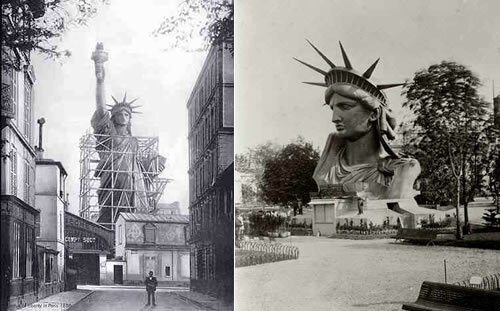 By now, the Statue of Liberty's right hand and torch were finished, so Bartholdi shipped it to the Philadelphia Centennial Exhibition and had it put on display. For a fee of 50¢, visitors could climb a 30-foot steel ladder up the side of the hand and stand on the balcony surrounding the torch. Two years later the statue's head was displayed in a similar fashion in Paris, giving people a chance to climb up into the head and peek out from the windows in the crown. But while events like these generated a lot of enthusiasm, they didn't raise as much money as Bartholdi hoped for. In 1883 the U.S. Congress voted down a fresh attempt to provide $100,000 toward the cost of the pedestal; the vote so outraged Joseph Pulitzer, publisher of the New York World, that he launched a campaign in the pages of his newspaper to raise the money. "The Bartholdi statue will soon be on its way to enlighten the world," he told his readers, "more appropriate would be the gift of a statue of parsimony than a statue of liberty, if this is the appreciation we show of a friendly nation's sentiment and generosity." After two months of non-stop haranguing, he managed to raise exactly $135.75 of the $200,000 needed to build the pedestal. In June of 1884, work on the statue itself was finished. Bartholdi had erected it in a courtyard next to his studio in Paris. The original plan had been to dismantle it as soon as it was completed, pack it into shipping crates, and send it to the United States, where it would be installed atop the pedestal on Bedloe's Island ... But the pedestal wasn't even close to being finished. So Bartholdi left the statue standing in the courtyard. In September 1884 work on the pedestal ground to a halt when the project ran out of money. An estimated $100,000 was still needed. When it appeared that New York was coming up empty-handed, Boston, Cleveland, Philadelphia, and San Francisco began to compete to have the Statue of Liberty built in their cities. Furious, Joseph Pulitzer decided to try again. In the two years since his first campaign, his newspaper's circulation had grown from a few thousand readers to more than 100,000. He hoped that now his paper was big enough to make a difference. For more than five months, beginning on March 16, 1885, Pulitzer beseeched his readers day after day to send in what they could. By March 27, 2,535 people had contributed $2,359.67. Then on April 1, Pulitzer announced that the ship containing the crated parts of the statue would leave France aboard the French warship Isere on May 8th. The excitement began to build, prompting a new wave of giving. By April 15, he'd raised $25,000, and a month later another $25,000 - enough money to restart work on the pedestal. At this point, the makers of Castoria laxative stepped forward to help. They offered to chip in $25,000, "provided that for the period of one year, you permit us to place across the top of the pedestal the word 'Castoria.,'" they wrote. "Thus art and science, the symbol of liberty to man, and of health to his children, would more closely enshrined in the hearts of our people." The offer of a laxative for Miss Liberty was politely declined; Castoria kept its money. By now the race to fund the pedestal had captivated the entire country, and money really began to pour in. People sent in pennies, nickels and dimes ... and they also began buying copies of the World each day to keep track of the race; by the time the dust settled, theWorld's circulation had exploded to the point that it was the most widely-read newspaper in the entire Western hemisphere. On June 19, the fundraising passed the $75,000 mark; on July 22, the Isere arrived in New York Harbor and began unloading its cargo; bringing the excitement - and the giving - to its peak. Finally on August 11, Pulitzer's goal was met. "ONE HUNDRED THOUSAND DOLLARS! TRIUMPHANT COMPLETION OF THE WORLD'S FUND FOR THE LIBERTY PEDESTAL." More than 120,000 people had contributed to the effort, for an average donation of about 83¢ per person. Work on the pedestal now moved at a steady clip; by April 1886 it was finished, and the pieces of the statue itself were put into place. The internal steel and iron framework structure went up first; then the pieces of the statue's outer skin were attached one by one. Finally on October 28, 1886, at a ceremony headed by President Grover Cleveland, the statue was opened to the public ... more than ten years after the original July 4, 1876 deadline. The statue was late - very late. But better late than never. The Statue of Liberty Enlightening the World (1886) by Edward Moran. The verse most closely associated with the statue, "Give me your tired, your poor, / Your huddled masses yearning to breathe free ..." weren't added to the pedestal until 1903 ... and only after officials realized what an inspiration the statue had become to the waves of immigrants arriving at nearby Ellis Island. The verses are part of "The New Colossus," a sonnet composed by New York poet Emma Lazarus in 1883; she donated it to an auction at the New York's Academy of Design to raise money for the statue's pedestal. The article above, titled "Putting Liberty on a Pedestal," is reprinted with permission from Uncle John's All-Purpose Extra Strength Bathroom Reader. The 13th book in the series by the Bathroom Reader's Institute has 504-all new pages crammed with fun facts, including articles on the biggest movie bombs ever, the origin and unintended use of I.Q. test, and more. ​Since 1988, the Bathroom Reader Institute had published a series of popular books containing irresistible bits of trivia and obscure yet fascinating facts. If you like Neatorama, you'll love the Bathroom Reader Institute's books - go ahead and check 'em out! The Statue was sent here by the Free Masons! This is likely to be a little tough to swallow for some Americans but The Statue of Liberty - symbolically welcoming the world's tired, poor, and huddled masses - was originally conceived as a Muslim peasant woman. As The Hill reports, The Statue of Liberty was originally designed to be a Muslim woman, the Smithsonian Institution's magazine says. An article on the government-administered museum’s blog, Smart News, claims one of the designers of Lady Liberty drew inspiration from monuments in Egypt and originally intended to construct a veiled female peasant on the Suez Canal. The Statue of Liberty was originally conceived as a Muslim peasant woman and was to have stood at the approach to the Suez Canal, a lantern in her upraised hand serving as both lighthouse and a symbol of progress. But the sculptor, Frederic Auguste Bartholdi of France, proved unable to sell the idea to the khedive of Egypt, Ishma’il Pasha. Bartholdi remained determined to erect a colossus on the scale of the one in ancient Rhodes. He sailed to America with drawings of the Muslim woman transformed to the personification of Liberty. At first, Bartholdi considered the tip of Manhattan and Central Park as possible sites. He was on a ferry to Staten Island when he decided that Bedloe’s Island would be just the spot. To truly be Lady Liberty, the figure built with kids’ coins and originally conceived as a Muslim must remain a Muslim as well as a Christian and a Jew and a Hindu and a Buddhist and every other faith, even no faith at all.